Guest blogging used to work really well in 2014, when it was new, needed a lot of effort, and it was marked as a viable white hat SEO tactic. In other words, it was a great way to get traffic for your website. It’s still a viable way to boost your audience reach, get more traffic, grab some valuable backlinks, and to push your search optimization efforts several notches up. For those who do it right, guest blogging works. Bamidele Onibalusi, who published his story on guest blogging success, writes that his efforts to publish over 31 odd pieces of content resulted in an additional 100+ daily visitors to his blog only after 10 days of his posts getting published (works out to be 2000+ visitors from a single guest blog post, which then trickled down to 10% later). Moosa Hemani — an Inbound Marketing Specialist who works for Thrive Marketing and a blogger at SEOtalks.com — reveals that his guest blogs on Moz resulted in 3000+ new visitors to his blog with an average read time of 4 minutes or so per visitor. 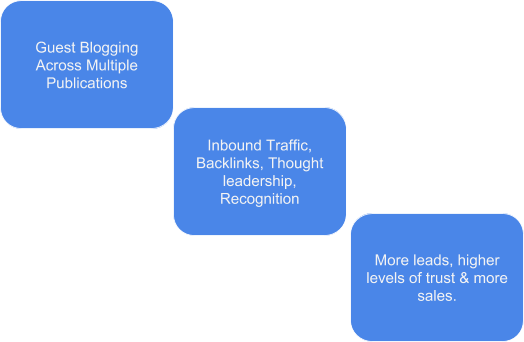 Simply put, guest blogging brings you traffic (in addition to backlinks for SEO, recognition, authority, prominence, and thought leadership). Most guest blogging efforts, however, go down the drain after the initial excitement and hustle die down. Most bloggers, online publications, startups, and business owners don’t get to gain as much from guest blogging as they’d love to. 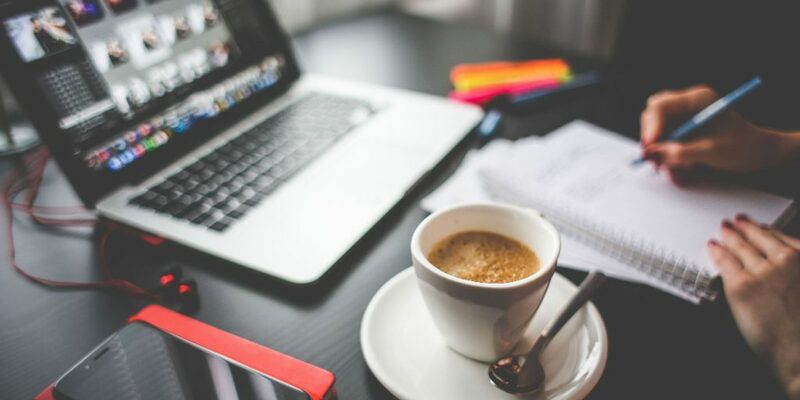 While you can certainly hit upon the exact process of guest blogging, how to do keyword research, the tools you’d need, and the content ideas you’d need to stock up on, you are missing a few crucial inputs that will either make or break your guest blogging efforts. Inbound marketers and business owners are usually hard-pressed to get results. If your focus is on results, you should try paid advertising, like Facebook ads, since most paid advertising platforms require almost no interaction with humans, are mostly DIY, and they bring you results fast. For guest blogging to be effective and at scale, you’d need a wide berth of relationships with other bloggers and publications you can count on. Just because you show up with a blog or a business, no one is going to sit up and take notice. You aren’t going to get a red carpet welcome. It’s particularly hard to reach out to bloggers and publications that you want to guest post on without a relationship with them, to begin with. Most marketers and entrepreneurs typically send out cold emails or pitches (ideas for content) to publications requesting permission to do guest blogging — that’s a cold approach. While the cold approach does work in some cases, you can’t scale these efforts. Plus, what about all those hits and misses that you don’t count? See, how different the second approach is? it’s indirect, long-winded, and doesn’t “ask ” for anything. It’s friction-less, and it’s friendly. It’s built for conversation build-up and paves way for real relationships. Think about this: With guest blogging, you aren’t working to put a piece of art in a high-profile art gallery; it’s a blog post and you’d need to get as many guest posts up and published as you can while still being able to appease the publication while you are at it. You won’t like it, maybe, but there’s no such thing as the original. News publications can at least claim to be “timely” and “relevant” about the pieces they publish but for the rest of us, there’s just creativity and production value. There’s just too much of an ask about every post being “original” when you finally roll your sleeves up and start reaching out to people (cold pitches or not). Ignore that ask for being “original” because there’s no such thing in this world. Try to beat the best blog post already published on a subject (find this on search, for any topic), and it’s as simple as that. Most online publications demand exceptional content from you when it comes to guest blogging. If you think your content is excellent and is worth publishing, it’s a good start. But it’s no guarantee that your blogs will be accepted for publishing. First, you’d need to give them what they want. It pays to go through the host blogs or publications in question, read through their published blog posts, and get an idea for the level of quality they expect, their usual tone and language used, and how they tend to write their blogs. Second, send out pitches that are a level above (or at least equal to) the standard of blog posts they are used to. Third, actually deliver an exceptional post that they’d be more than happy to publish and share on their social media networks. Trying to do guest blogging with mediocre content, just because everyone suggests that it’s a viable way to get traffic and links to your blog is a fault line that can break. Let’s assume you get a good head start on your guest blogging campaigns. We’ll also assume that you managed to pick a few, highly-relevant host blogs and got a few blog posts published. It’s a commendable start, but it’s not sufficient. Guest posting once or twice won’t get you what you do. If you want results from guest blogging, you’d have to continue to keep writing and publishing, over and over again. And then you’d have to do this for a long period of time to start getting you results. The reason why this works is because of the power of compounding of your content and the gradual way your efforts lead to the results you seek. A swarm of traffic to your website (enough to make your hosting servers crash) isn’t a complete goal by itself when you start guest blogging. Regardless of what you might have heard, guest blogging is a mind-bogglingly hard initiative. You’d better make all that effort to work for something tangible for your business. Create multiple calls to action, each leading to a dedicated funnel or a landing page. If you just published a guest post on “Copywriting techniques”, you’ll want to point your readers to a call to action that says “Get 100 swipe-ready Advertising Copy Templates for Your Business”, and your funnel starts with this exact giveaway (a PDF sheet, maybe?). Read more about how to build funnels that work. Also, get access to a webinar that teaches you everything you need to know to build funnels that work. Be sure to have multiple author bios, each written much like an ad for the specific call to action you’ll use within your author bio. Your author bios should be relevant to the call to action you’ll point to. Apart from just letting the world know who you are, your author bios should work like full-fledged ads to push people to click through your Call to action and landing at the top of your funnel or on your landing page. As with most things, working on your guest posting efforts can continuously bring in a steady stream of traffic, get you leads, and eventually put you on the orbit of profitability. If you’d like to learn how to turn that traffic into sales, register for this free workshop!